I figured it was time to have a fourm topic of "You know you're obsessed when" because they're SO much fun to read...partly because it's all true. So I'll start with a few of my obsessions, and you can take it from here! 5- You could/can perfectly quote the movie after only 2 viewings. I have been thinking over a list like this for a couple of months now, so I have come up with quite alot of "obsessed" possibilities. I'll post some of the ones I've done. 19- You knew the story, characters, details, and trivia before the movie came out. 20- You dream of finding a way to Underland. 21- You freak out a little when you see anyone wearing clothing with red hearts on it. 22- You broke your bank at Hot Topic or the likes on merchandise from the movie. 23- Your favorite color changes to blue. 24- Your clothes stop matching. 25- You never brush your hair anymore. 26- You believe the hat pin is mightier than the sword. 27- You can spell and pronounce all the names from Underland. 28- Your Google alerts are set to tell you if someone in the world even mentions Alice in Wonderland once. 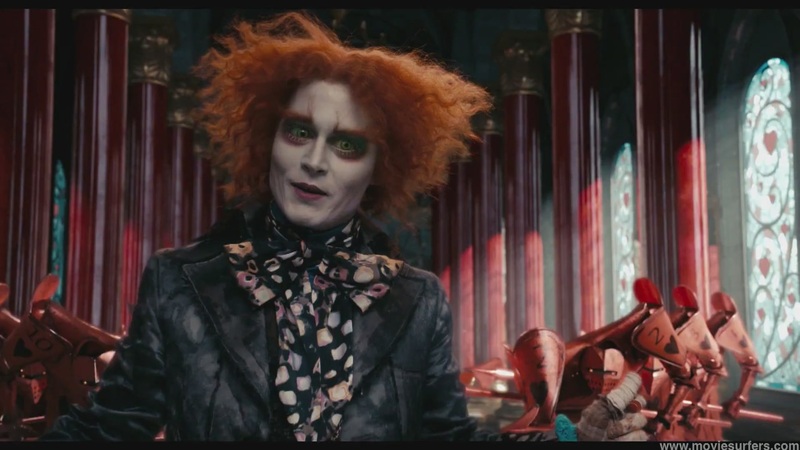 31- Your friends freak out every time they step into your bedroom – they are confronted by a huge, framed poster of the Mad Hatter. 32- You find some way to relate everything back to Alice in Wonderland. 33- You don’t eat Butterfingers bars anymore – Who knows what they’re actually made of? 35- You spend all your free time on the Alice in Wonderland spot. 36- You curse in outlandish at anyone who says they hate Time Burton. 37- Your desktop wallpaper has something to do with Alice in Wonderland. 39- You want to study Dominion Over Living Things. 40- You memorize “The Jabberwocky” and recite it to anyone who will listen. I have loads more, if anyone wants to know, but I think that's enough for this post. 51- You decide that, when you have a child, you are going to call it "Tarrant", "Stayne" or "Absolem" if its a boy, or "Mirana", "Iracebeth" or "Mallymkun" for a girl. 52- If you already have children, you have officially changed their names to "Tarrant", "Stayne", "Absolem", "Mirana", "Iracebeth" and/or "Mallymkum". Haha, these are great guys, keep them going! 68. If you know a pair of twins you address them as "Tweedle Dee" and "Tweedle Dum"
69. Whenever you get mad at someone you scream "OFF WITH HIS/HER HEAD!" 72- You know all the lyrics to the songs on the “Almost Alice” CD. 75- Your friend, who has never seen the movie, can rattle off the names of the main characters, the names of the actors who played them, and the basic plotline going only on what you have told them. 76- You wish that you were small enough to travel by hat. 78- You look for a rabbit hole everywhere you go. 79- Most of your computer hard drive space is taken up by pictures from Alice in Wonderland. 80- People don’t ask you anymore what your favorite movie is. They already know the answer. 81- You take a lot of naps in hopes that you may dream yourself into Underland. 82- You brush your teeth a lot to get that perfect Chessur smile. 84- Your the first to find out when someone has watched Alice. "63. You talk with a Scottish accent when you're angry"
HA HA HA! This is a GREAT one. I mean, they are all great, but this one made me cry laughing. 86- You no longer consider it an insult to be called a dodo. 89- You make a list every morning before breakfast of six impossible things you believe. 91- You have read this far on the list. 92- You have printed out a copy of this list and are highlighting all the things you have done. 93- You get cravings for squimberry tarts, even though you have absolutely no idea what a squimberry is. 95- Your spellchecker hates you for typing names like “Mallymkun” and “Iracebeth” constantly. 96- Your mother takes all your Alice-related things away from you. And it is a fate worse than death. 97- You made a playlist on your computer of songs that are not officially related to Alice in Wonderland, but that remind you of the movie. 99- You are intent on proving your muchness. 100- No matter how many times you see the movie, the funny bits still are funny (and they keep getting more so). "94- After your eye doctor says you can get contacts, the first thing out of your mouth is “Can I get crazy green ones?” "
One or two days a month?!? At that, I'd say "What's the point, then?" I may or may not have done any of the following. I'll leave you to your common sense to decide which ones I am guilty of. 103- You now insist that all dragons are actually Jabberwockies. 104- You take a vow not to harm any living creature (though you are known to break it occasionally). 105- You have ruined many a watch dunking them in cups of tea. 106- You find yourself attracted to very tall people. 107- You have been expelled for trying to kill the school bully with the Vorpal Sword. 108- You grin at all the cats you meet in hopes that one of them will grin back. 109- You are known to jump down holes you see, and have at least once gotten in trouble for jumping down a manhole. 110- Your wardrobe has been taken over by Alice in Wonderland-themed clothing. 111- You build a Horunvendush Day memorial in your backyard. 112- You hold services there occasionally. 113- You confuse your friends with Absolem-like logic and advice. 114- You don’t buy hats anymore. Instead, you make them yourself. 115- You decorate a footstool with papier mache too look like a pig lying on its back. 116- You dye the swimming pool red and fill it with rubber heads. 117- You wear prosthetic ears/noses/chins/etc. so that you look like you came from the Red Queen’s court. 118- You won’t marry a lord no matter how nice he is, just because he’s a lord like Hamish. 119- You want to move to London. 120- All kinds of strange red marks seem to turn up on your hands and you have no idea how they got there. 121. Whenever somebody describes something as "impossible" you reply "only if you believe it is". 122. Your signature pick-up line is "I like Largeness"
126- You actually TYPE with a Scottish accent whenever you're mad. I have done all of the following. 133- You crack up when you see a road sign for "Hightopp Drive". 134- You suggest that for next year's spring show, your dance class do a futterwacken. 135- Time has no meaning. 137- You have a crick in your neck from sleeping with the visual guide, novelization, and visual companion under you pillow. 139- Your brother got a kick to the shin for saying that Alice in Wonderland is stupid. 141.- you start to jump into every hole in town! 142-At any chance you get you manage to quote something from Alice in Wonderland. 143-Speak with a lisp like some of the characters in the film. 145-Scream when you see anything Alice in Wonderland related. 146-When you get a house, you are going to call it Underland. 148-Ask for a pet Jabberwocky/bandersnatch. 149-Have attempted to paint a cat with blue strips so that it resembles chesh. 150-Have named your cat Chesh. 151-Whenever you see a cat you expect it to start talking and then evapourate! 152-(related to 149)Have ACTUALLY dyed your cat grey with blue strips. 153-Argue with your cat about whose fault something is. 154-Tried to make a potion to make your cat disappear. 155-Dyed your hair an unnatural orange and painted your face white with all Hatter's make-up. 157-Have thought of every way for all Alice in Wonderland names to apear on a licence plate. 158-Treasure your Alice merchadise as national treasures. 159-Have, literally, argued with your art teacher aboout how good the movie is. AND WON!!! 160-Will not let anyone touch your Alice DVD, even your own mother. 161-Have started to wear your make-up like Iracebeth, Tarrant, or Mirana. 162-Will not even speak with your brother/sister until they watch the movie. 163-All your school projects become Alice based. 166-Refuse to believe any movie is beter then Alice, including Avatar. 167-Have already made plans to legally change your name to Alice Kingshliegh, move to London, and search for that rabbit hole. And hopefully find a man named Tarrant Highttop. 168-Yell at your computer because you can't finish the PC Alice game. 170-Have actually read the original Lewis Carrol Alice's Adventures in Wonderland because of the movie. 171-Have read every fanfic on the movie, no matter the rating or paring. 172-Want to paint your entire house in Underland themes. 174-Walk around with a Mad Hatter plushy, either bought or made. 176-Always wear your pair of Hatter earrings with anything and freak when you've forgotten them. 177-Demanded an Alice in Wonderland birthday cake with figurines and everything. 178-Can actually figure out where the movie is by just the music while in a different room. 179-Have started embrodering Alice characters in everything you own. 180-Bought the Blue-ray/DVD/Travel combo pack even though you don't have a Blue-ray player just to have all three copies of the movie. 181-Are trying to convice your parents to get a Blue-ray player just to be able to watch Alice in Wonderland and the Futterwaken. LOL @ 181-Are trying to convice your parents to get a Blue-ray player just to be able to watch Alice in Wonderland and the Futterwaken. You are lucky! My parents still wont! 185- You can fluently repeat the Hatter's list of hats. 186- You repeat the list any possible opportunity. 187- Your friends are now sick of hearing the list of hats. 188- You know the full recipe for Pishsalver. 189- You are constantly trying to find the recipe for Upelkuchen. 190- You wrote a story based on Alice in Wonderland. 192- Your favourite word is now "fez". 194- No one knows what in Underland you're talking about when you say "Off with the bloody big head!" 195- You constantly shout: "You're late for your soup ya wee besom!" 196-You've noticed that there is no red or white kings in the movie and wonder why the game hasn't ended yet. 197- You laugh derisively when the term "Aunt Alice" turns up in The Battle For Rondo. 198- You stick a tag onto your drink bottle reading "Drink Me". 199- You constantly compare any knife to the Vorpal Sword. 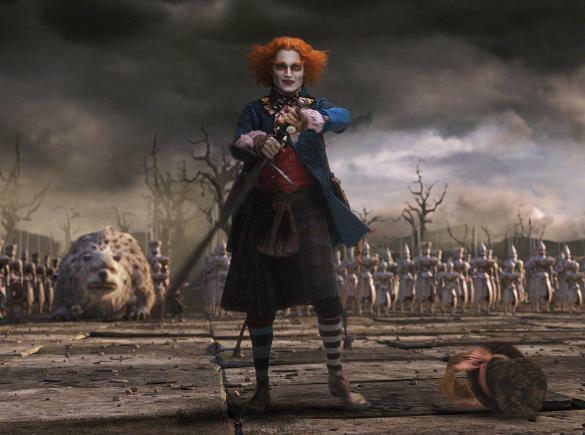 201- The phrase "mad as a hatter" brings new meaning into your life. 208- you have this forum as your favorites on Fanpop and check it regularly for more list updates. 212- (continuation) your mother confiscates the MP3 Player/ iPod because you listen to it non-stop. 213- (continuation) you realize your mother just did you the biggest favor ever: you now dream again every night and have renewed opportunity to dream of your favorite AIW characters.